During a visit from Ben Affleck on Jimmy Kimmel Live After the Oscars Special Sunday night a new clip from 'Batman V Superman: Dawn of Justice' premiered. 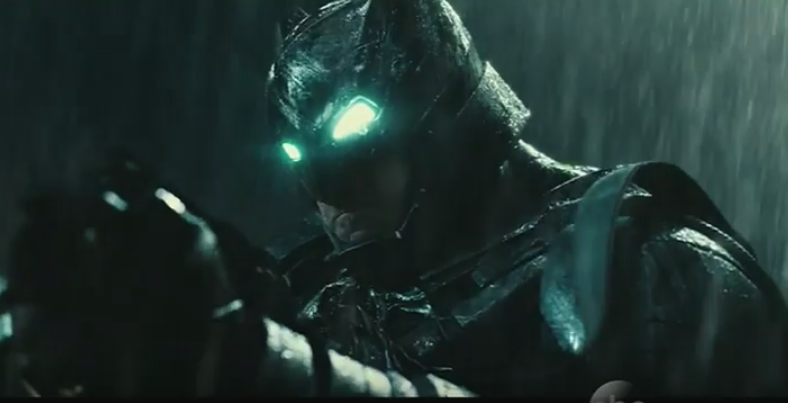 The brief sneak peek featured the fight between Superman and Batman. After taking Bats through a building tossing him on the roof, Superman warns "If I wanted it, you'd be dead already." Bats creates a smoke screen that Supes quickly breaks through only to find a rocket coming towards him. Affleck talked about his Oscar experience when he and Matt Damon won for Best Original Screenplay for "Good Will Hunting" in 1997. He also added a cute anecdote about his son requesting he be Batman for his birthday party this past weekend. His son wanted other heroes as well so Affleck borrowed the official suit from the studio after signing release forms and hired other performers to play Iron Man, Captain America, Wonder Woman and Superman. Sunday night also saw Turkish Airlines release a video featurette featuring 'Batman V Superman' director Zack Snyder talk about the world building of the film. It contained a lot film footage we've already seen and it was more of an informercial for the airlines than anything else. Lastly, before Affleck left he had to break the bad news to Jimmy that his scene in the movie had to be cut. Luckily, Affleck brought the scene with him. It places Jimmy between Affleck as Bruce Wayne and Henry Cavil's Clark Kent during a confrontation. Jimmy can't help but notice something familiar about Kent and Wayne. There's also some amusing cameos so it's definitely worth checking out.